I am pleased to convene today’s hearing on the very important topic of retirement income security. One of my priorities as Chairman of this committee is helping American workers of all ages prepare for a financially secure retirement. So I plan for this hearing to be the first of many conversations on this issue. Unfortunately, Americans are currently facing a retirement income crisis, with too many people in danger of not having enough in retirement to maintain their standard of living and avoid sliding into poverty. Social Security benefits are modest, employer-sponsored pensions are disappearing, and too many people find it hard to save for retirement. When President Roosevelt signed the Social Security Act, he said it was to guard against the unexpected hardships of life. Let me tell you, I know all about those unforeseen challenges from personal experience in my young life. Democrats will continue - as we always have – to protect the intergenerational guarantee that Social Security provides for American families. But Social Security alone is not enough, and it was never intended to be complete in itself. While it is the foundation that workers can count on, we need to do more to help workers prepare for a secure retirement. Americans are increasingly forced to work past retirement age. Between 1977 and 2007, the number of workers over the age of retirement increased by 101 percent, and the number of workers age 75 and older increased by 172 percent. In addition, nearly half of American private sector employees – roughly 55 million – work for an employer that does not offer a retirement plan. Most of these workers are employed by small businesses, the fastest growing segment of the economy. Increasing opportunities for employees to save through a plan at work could make a huge difference for families – having an employer-sponsored retirement plan is key to preparing for retirement. For workers earning between $30,000 and $50,000 per year, over 70% will participate if offered a retirement plan at work. For those same workers, only 5% will save on their own through an IRA. These facts underscore that the retirement crisis in America is real and will only worsen unless we strengthen Social Security, make saving easier, and do more to encourage employers to offer retirement plans. To address the retirement crisis, we must develop solutions to help Americans prepare for retirement. This means Democrats and Republicans rolling up their sleeves and developing ideas together. It also means the retirement industry coming together with participant and retiree groups. Pensions have had a long history of being a bipartisan issue. Now more than ever, it’s time to put politics aside and really work together to address this crisis. There are a number of good proposals that will provide us with a solid starting point. 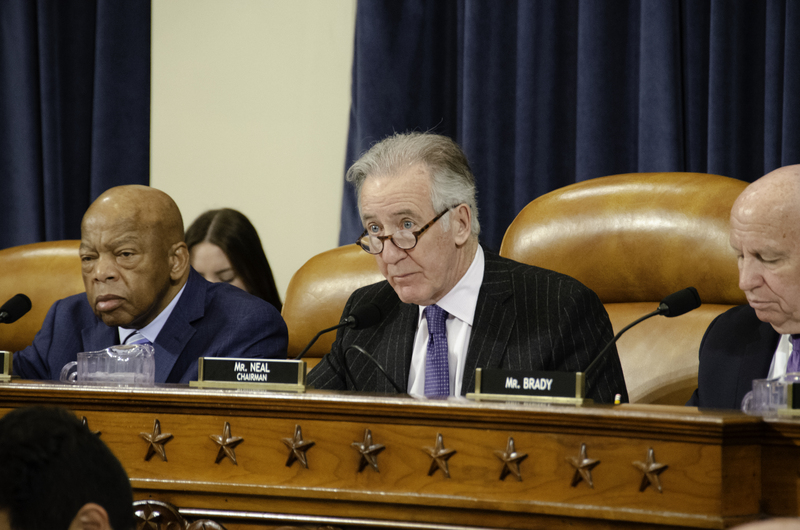 For example, Representatives Kind and Kelly have a proposal that would encourage open multiple employer plans to make it easier for small businesses to sponsor retirement plans. And I have introduced legislation that generally would require all but the smallest employers to maintain a 401(k) plan for their employees. This bill, which has broad support from a variety of groups – from AARP to a number of financial services companies – would provide an opportunity to save at work for millions of Americans. Before concluding, I want to highlight my continued commitment to addressing the multiemployer pension crisis. We all know retirees with failing multiemployer pension plans who now find themselves in a devastating predicament. These are American workers who planned for their retirement, who year after year chose to contribute to their pensions instead of taking a wage increase. Now, after working for decades, their planned retirements may be taken away from them. And taken away at a time when they’re no longer able to prepare for retirement because they’re now in retirement. And I’m pleased that one of our witnesses today will tell her personal story about her families’ pension benefit. There’s no time to waste in addressing this crisis and I call on my colleagues to support the Rehabilitation for Multiemployer Pensions Act that will help these troubled plans. With that, I’d like to turn it over to Ranking Member Brady.